CNBC has launched a new version of its iOS app, which is available for download in Apple’s App Store. CNBC’s fully redesigned app offers users improved personalization features, news and video experiences and UI design. A “For You” news section of recommended content informed by the keywords associated with the articles, videos and quote pages the user viewed. Customizable news sections which allow the user to select which News sections appear as Selected Sections and in what order. Categorized breaking news which allows users to decide which types of breaking news they receive through push notifications. The CNBC iOS app also provides unauthenticated users with a daily, ten-minute free preview of the CNBC TV U.S. livestream. Additionally, the app has integrated an immersive video playback feature, which allows users to see what video is currently playing and what is up next, making it easy for users to scroll between videos and quickly identify what content is available to watch. Combined news and symbol search allows users to find both quick and in-depth information about a particular stock. Improved quote pages, including interactive charts that allow users to select different time periods for a quick look at the asset’s performance as well as corporate events alerts. Trending Today Widget which offers users the ability to swipe right on their device’s Home screen to get the latest Top News articles and most searched stock symbols. 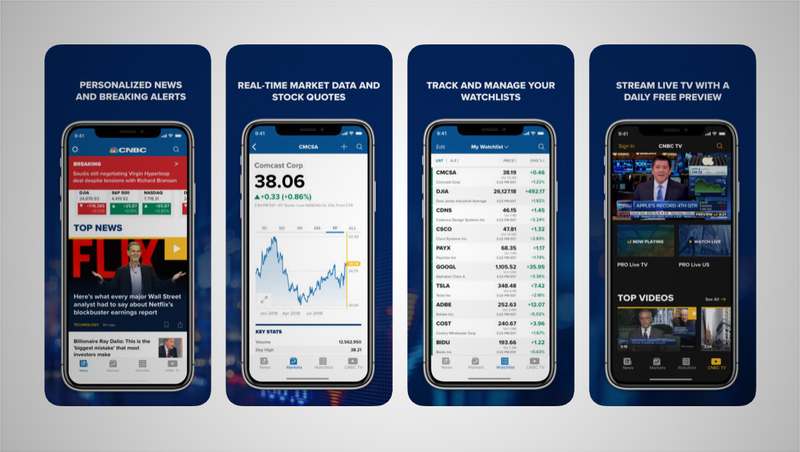 3D touch integration allows users to press down on the CNBC App from their home screen to reveal a quick action menu, which includes a shortcut to Search, Watch Live and CNBC PRO Live, as well as a trending quote page. Additionally, CNBC podcasts such as “Mad Money with Jim Cramer,” “Fast Money,” “Strange Success with Jane Wells” and “Fortt Knox with Jon Fortt” are available to stream in the app. The CNBC iOS app is available on all iOS devices supporting iOS 11 and above.